Well today is day 23, I am sipping on my latte WITHOUT sugar and it is getting easier and easier with each day. I do think I might try and eat 1 piece of fruit a day for the next month. I am not a fruit eater, have never been. My basic fruit list is pineapple or berries. So might make that the next challenge. I am tired today but counting the hours down till my boss is back from her holiday, poor love she has had a great holiday in Paris but all good things come to an end. I have visitors arriving today for a few days, I do think that it is nothing I can't manage, foodwise that is and plan to keep doing what I am doing. I must admit once your mindset is in place, things are easier and at the moment I am highly stressed. I have gone off the anti-depressants but really t hink that I need to be one them. My problem is I think I am doing okay and go off them and then after about 3 months, fall back into old habits. Next week, exercise is on my agenda. Definitely going to face my fear and do that bloody Zumba class, I am the only person in the known world or Weight Watchers world that hasn't tried it. So will do that to break the routine. So I think my next two challenges might be exercise related and fruit related. Just have to decide on a reward for achiving the challenge. Not much else happening really. 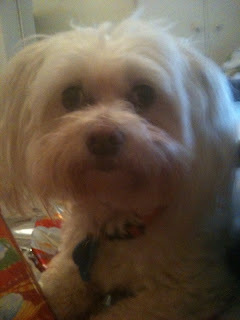 Woke up this morning to Vince the wonderdog staring at me like I am some type of god, so we have ten minutes of cuddles. 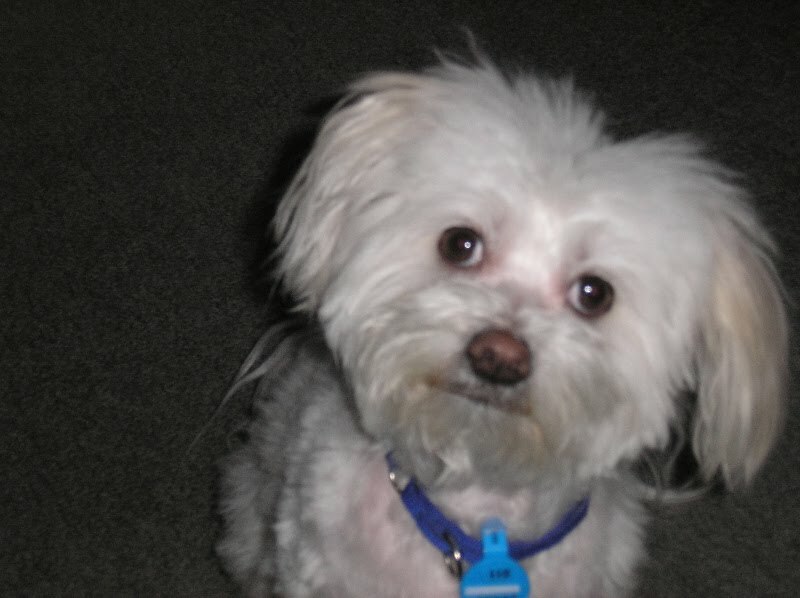 Being single is hard, it isn't easy but I come home to this little guy who is so excited to see me and makes me feel a millon dollars. Anyway, nothing mindblowing happening. Well, Day 22 is here already. As you saw in last night's post, I am thrilled to say that I have lost 3.2 kilos in three weeks. Last night lost 600 grams and that is great considering I have been unwell all week, stressed with work and my period is now 5 days overdue. Next weigh in I am hoping, or should I say, I will have another loss and that new gym bag will be brought. My focus is to get through this next week, my lovely boss is back on Tuesday from Paris and so things will get back to normal. I have a Trust Account Audit on the 15/10/10, so after that I plan to take some leave and just chill out a bit. So, I have to work hard this week just to keep on track. We have a challenge at WW, we have been all given a tree, each week there is a challenge and depending on how much you lose you get a sticker (or fruit) for the tree. This week's challenge is tracking, so luckily that is something that I do regularly and it keeps me on track. Not much else happening. Well the weekend has been and gone. Got some jobs done around the house, so that is thankfully a few things off the list. Still battling this cold, the boss is away so I am having to keep going to work, so it is getting worse by the day, unfortunately as I work for a sole practitioner I have to keep going. But my boss is great, so I do it for her. Not much else happening, the food is reasonable. Feeling flat, a friend got engaged on the weekend and I am thrilled, I advised her not to make the same mistake as me and waste your time on a guy who is committment phobic, she got rid of the guy and now 12 months later is engaged to a delightful guy, I cried like a baby. I am so glad she took my advice. This is a pretty boring blog today, but not feeling the brightest but mainly due to work pressures that I am finding a bit rugged at present, thankfully this is the last week whilst boss is away. Well Day 17 is not bloody fun. I have had quite a stressful time at work the last 24 hours purely trying to deal with a difficult matter whilst my boss is away, yesterday I ate McDonalds for tea and a muffin and a soft serve. I could have ate and ate, luckily on the way home I caught up with Jo J (I have about 6 friends called Jo, it drives me crazy) and had a glass of Rose and a chat to her. This morning I woke up highly emotional, my period is due and that will do it, I am tired and emotionally tired of trying to get things done both at home and work, so had a quick telephone conference with the boss overseas who was delightful as she normally is. So today I did a lot of thinking, and somewhere on someone's blog they made a comment (think it was Bitchcakes blog) that food is not going to take the problem away. I thought of that today and had a salad for lunch and have focused on 1 hour at a time, the success of the story is the binge I had last night, well really not a binge but a bad evening meal, stopped at a bad evening meal and did not continue during the next day. I think to top this all off that I am getting a cold or flu so that can't happen whilst my boss is away. So have got some cold and flu tablets and hoping that they nip it in the bud. So, I am feeling slightly better this afternoon, the fact that I really thought hard about the eating, at lunch time I could have polished off probably a week's worth of points but I didnt. Tonight I am going home to start spring cleaning before my guests arrive next weekend and just focus on keeping myself busy. My boss is back soon so things will get back to normal. There is always going to be stress in my life at various times, I do and must learn how to deal with it. Actually, I am pretty impressed with myself for not turning to food like I normally do. Day 15 and last night's weigh in results !!!! Drum roll please - another loss of o.6 kilos (making that 2.6 in two weeks). Well, from the beginning - yesterday was a bit of a busy day at work with my boss having a well deserved holiday. Left work and headed to my WW meeting. The week had been good and everything tracked, exercised two days at the gym - which will be increased and water intake increasing. The week had encountered insults from mum and as well my period due shortly - so you never know how you are going to go. Got on the scales and another 600 grams off. I was and am still delighted. You know, I take one day at a time and focus on the fact that these individual days all add up. The girls Tina, Tania, Karen, Jo S and I all lost and Sandy unfortunately couldn't make it this week. It is so good to sit with the girls and we have a coffee (only) after and talk about a variety of subjects, particularly this week our mothers. It is so helpful to have a meeting which is good, a class of people that are doing well and the gang of 6 there by my side. So I have now lost 2 weeks in a row and working on the next week. With my period being anywhere from a 27 to 31 days cycle I know that this week I have to be extra good as well because sometimes even the week after it has finished I can gain. That means that there is only two weeks out of four that I am not having to be extra carefuly because of my cycle. Men don't get this. We have a guy at our meeting that has lost from memory 3o+ kilos and continues to lose 2+ kilos every week. It is good to see that they stay for the meeting and to know that we are all in the same boat. A lady became a life time member, she is a little lady in height and we all agreed that her 11kg loss would be like my 30 kg loss, she would not and did not lose the numbers we do and it has taken 9 months. What is inspiring is the perserverance. To understand that this journey will take a while, it is not a rush. One of the pearls of wisdom from last night's coffee session is the fact that once we get to goal weight, we are certainly not going to have ideal figures. We will have loose skin, the girls with a larger behind may well still have a larger behind. I for one will not have a flat stomach or suddenly turn into Megan Gale (Aussie supermodel). So as you see, after our meetings it is also like a therapy session. So today the focus is on another day and day 15 without sugar in the coffee. I am still being aware of the sugar intake and trying to limit the foods with higher sugar content as it certainly has made me not crave the sugar or want to binge so much. After reading many blogs and some of the comments from a WW group I am involved with it seems a lot of people had been struggling with a lot of people putting that line in the sand but more importantly that they have lost that mindset. It is clear to me that mindset is 90% of the weight loss factor. This is something that during the journey that I need and want to focus on. To remind myself that day 15 has arrived and I have not binged on food or have turned to food when I am emotional. Yay for me. Day 14 - Second Weigh in Day !!! Today is my 2nd weigh in day. My period is due in 4 days and I have focused on tracking and doing the right things this week, as I normally should, but being aware that when this time of month comes around, I have to be pretty spot on to secure a loss. I feel I have lost, but that means nothing until I have got on the scales. It is nice to go with the girls to my WW meeting, it is so theraputic and a social event, it is nice that I have a leader that takes an interest in me. I would like to be 6 weeks down the track really, because I think with every kilogram that is lost, the more enthusiasm I have and I am really focused on keeping the mindset strong. I do believe that you get to a point in the journey where the losses are getting to add up to a larger amount and the monentum builds. Last night I didnt leave work till 6.30pm, a day of urgent family law matters, so the gym was given a miss. Ideally I say 3 times a week initially, once the weight comes off, the energy increases, so can the exercise. Baby steps. So last night I sat down and watched the Brownlow Medal Count (for those outside Australia, it is an award ceremony for best player in the Aussie Rules Football league), the men are strictly black tie, the ladies (or WAGS) out do each other. I used the night as a visualisation session, not that i will be going to any black ties soon, but there is nothing like a slim girl , even in a bad dress. So tonight I am off to my meeting for my second weigh in, I will post my loss when I get home. I am now day 14 without sugar, still going strong. Week 3 is about to commence and I am 14 days of good tracked food and water. Yay me. The weeks go so unbelieveably quick, in a way when you are doing any type of weight loss program, that is good, if you are good with all the things you need to be good for (tracking, portion control, water, exercise) then hopefully the weight comes off, each week will be another amount of weigh off my initial amount of 51.5 that I need to lose. I really am interested in keeping my mindset strong, by doing little challenges for myself and rewarding myself with them. My water consumption is not too bad, it is getting easier and although I don't drink all the water I should, each day I drink more. So will report in tonight. Week 3 here I come ! Days 11 - 13 (Sat to Monday). Pat on the back for me ! "Exercise is one of those things that once you have done it you feel really energized. In fact the reality is that you need to use energy to gain energy.Some of you may recall that I have mentioned, either in this newsletter or at meetings, the CYCLE OF FITNESS.If you can imagine trying to push a car that has run out of petrol! You exert a terrific amount of energy and force to begin with but after a while as the car gains momentum it appears to be easier. Similarly as you lose a little bit of weight and eat a healthy balanced diet you find a bit more energy and with that energy you can undertake a bit more activity and with that activity you lose a bit more weight, gain more energy and look to do more activity and so on. It takes a little perseverance and effort to get started but once you do I will guarantee you won’t look back"
Hi girls Well, there is a bit to post today but will start where I finished off last night. Left work later than expected but had to meet Karen who wanted to give me something, it was all very mysterious, so we meet at McDonald's car park near where I live. I got there later than expected, and Karen was there to meet me and handed over Annette Sym's latest cookbook duly signed. For those living outside Australia, Annette Sym lost quite a bit of weight with Weight Watchers and I think from memory for a time might even been a leader. What she did was publish herself a low fat cookbook with the nutritional values on each recipe, including if you vary a major ingredient - for example it might say Pork and you swap it to Chicken, the nutritional panel will also say chicken. Anyway, they have been a run away success and this is book 7 I think. Karen works/worked with a lady who is Annette's best friend and got a copy signed for me as a gift. I was so so touched that someone other than myself thought of me for a change, instead of the other way around. Anyway, as I knew I wasn't going to get to the gym, I suggested a coffee, as McDonald''s was manic and there was a 20 minute wait for McCafe coffee's we declined but sat down and solved the world's problems. Got home and my aunt rang for a chat, then it was too late for the gym, so heated up a bowl of soup and tried to sleep. When I woke there was a message on facebook from an old boyfriend I dated in my very early twenties, I rang mum this morning, not that I am interested in this guy but it is lovely to think someone is flirting with me. Mum said "does he know about your weight?" to which I replied "trust me Mum, men aren't as obsessed with my weight as you are" to which she replied "Martine, you are wrong". I did advise her he saw me at Christmas. I consequently burst into tears after this but rang Karen as she does understand more than I will say on this blog. My issues with my body and self esteem come from constantly being hounded about my weight, I know I am overweight - I don't need to be a rocket scientist to understand that. I know she thinks she is helping, but my first thought was that I prove her wrong and not lose a pound. Of course, that was a thought for a micro second but I can imagine when I get to goal that I will be too thin. My darling friend Tania has for years advised me that I must address this, I agree but the thing is with my mother I will not win an argument. Weight issues are the only thing Mum and I argue about. To be honest today I was tempted to pig out, to eat a donut but talked myself through it and thought of myself and how much happier I will be thinner. I shudder to think what she will say if I lose the weight and then meet the bloke. Today for lunch I brought myself cold rolls which are low in points and extremely yummy as a treat and will go to the gym tonight even though it is the last thing that I can be bothered doing, I know that I will feel better for it. The tracking is going great guns and as I said to Karen last night, this is the last time I am doing this (ww that is), the next challenge will be maintenance. AND I BELIEVE IT. So today, even though I was upset, wanted to eat all and sundry but the thing is I didnt and that is a major step. All I need to do is focus on one day at a time. Ideally by Christmas if I could lose 10kgs by then I would be happy but as long as the scales are constantly going down that is the main thing. It is not a race. I am proud of myself today as I didnt eat. Well, I have just come back from lunch, it is a such a nice day in Adelaide today, although I am tired and have no energy it is nice to get out in the fresh air. Adelaide has had a lot of rain this Winter, which although is absolutely needed because of the drought, it will be nice to have some sunshine. Today I thought I would have a Subway 6" sub with honey and mustard dressing. It was nice for a change, bumped into friend and leader Sharon and had a chat to her. One of the divine things about doing WW, this blog, and the WW Support Facebook Group is the support of people. I have had some just lovely and caring comments on my blog since its inception - to date the weight is the same but obviously now I am at the caring and sharing WW meeting at Mawson Lakes, I am feeling somewhat confident. People who have weight issues, even though they might be different people understand the effect it has. People like Penny from NZ - who always makes a lovely comment, Chris (aka diet coke) who always leave a lovely comment. When I see comments on my blog, you know - it just tickles my heart. I am lucky that I am a fairly open person, I might get self conscious or embarrassed but the WW online community I can be myself, I feel they all understand. Finished work late last night but got 30 minutes at the gym, will be building the time and intensity up. As I haven't been for about 6-8 weeks my fitness is almost no existent, but it won't take long to build up. At present when I am on the cardio machines, I am noting the levels, time and distance - ultimately I would like a heart rate monitor that I can download, it will be interesting to see how many calories I am burning, but that will be for a significant goal. With the gym, I don't hate it - actually I like it but as I am carrying extra weight I do get very very hot, my feet hurt and I am tired but I think what will be interesting is when the weight comes off, whether I can feel a difference, I am sincerely hoping that my feet improve. At present I feel very time poor, one of the reasons is that I am so bloody tired, so I get behind in things, then that makes the sleeping worse. My key to keeping me sane is being organised. One of the areas of improvement is the morning, not my best time. I have driven into work the past two months, purely as I am so exhausted, by 4.20am - I am still fluffing around trying to get to sleep. So, the plan I have of focusing on one day at a time is working. I have always been a believer in self-talk, the plan is to focus on one day and even one meal at a time. The days fly by and I remind myself that all those individual days add up, before I know it I will be at WW doing another weigh in - this week my period is due at weigh in, the focus is to keep being good and ensuring a loss because I really want that 4 losses in a row. I think my second goal might be gym orientated with a challenge/goal of doing 1 gym class a week - whether it be yoga, zumba, pump - that way I face my fear. I did last night manage to have a good chat (now girls I love a good chat) with the instructor that does Zumba, luckily I know her as she instructed me when I did bodyjam - that still makes me shake with fear as I needed to be too co-ordinated. We had a discussion and she suggested I come to the 6.30pm Friday night session, I might just so that. I have a fellow friend and weight loss buddy, she has done significantly well with her weight loss through pure hard work, she trains a lot with a persona trainer, but I sit back and notice the various stages she goes through, at one stage she was very scared of classes, now she attends them and even the dreaded RPM classes with gusto and I sit back and smile and feeling saying to her "look how far you have come" but I want to be able to say that to myself. At present I feel in a good spot, I am slightly depressed at present but it seems the whole world is feeling this way, but what I know, is with work, determination and tracking my heart out I can secure a loss this week and with every week and kilogram that my weight goes down, not only will my physical health improve, but my mental health will as well. Well, yesterday was my first weigh in at the WW meeting at Mawson Lakes. I must admit that I had no idea how I would go, as posted last night I am pleased to report a 2kg loss (only 49.5 to go) - not that I am worrying about that. I got to the meeting, pleased to say I didnt get lost and meet up with Karen and Jo S who was transferring from another meeting. Jo S is one of my online girls from a closed facebook group with WW Members. She has done swimmingly and lost 27kgs and due to a back issue had gained some weight but 27 kgs is a great effort - she wanted to join our merry group. So at our meeting we have Tina, Tania, Sandy, Jo S, Karen and myself - it is great to have that support and the meeting is a social thing for me. Upon arriving at my meeting, my leader Tina came up to me with a smiley face and hello - that is my type of person and checked how I went after I weighed in. All set to focus on the 2nd week and the next 7 days. We go for a coffee after the meeting and solve the world's problems, always nice. I am at Day 8 of going without sugar in my coffee, it is getting easier and think my plan of going cold turkey has been the way to go. The thing is, baby steps and remembering it is not a race. Tonight off to the gym, havent decided whether to do weights/cardio or Zumba, it depends on how I go. There is a Zumba class on a Friday night so may make that a regular thing. Exercise does not rock my boat, but it does make me feel happier when I finish. This week's topic is Lunch: At the meeting we discussed lunches and the various options you can have. I am luckily lunch isn't a thing I stress out on too much, but admit to pre-WW days or when I am off the plan that the odd Muffin/Donut used to pop into my mouth. The normal routine for me is either a sandwich or wrap, a salad and sometimes I make a salad of rice/couscous with some protein and divide it into my containers and just take one out of the fridge. Each Wednesday I meet my best friend, so that is normally a coffee and sandwich. So, week 1 has gone and working towards Week 2 weigh in. My period is due in 9 days so this week the plan is to be extra good and eat non processed food, I rarely eat processed food anyway, ensure I have lots of exercise and drink my water so that next week there is a loss of some description, the following week will also be the same as sometimes I lose just before my period and gain the following week. After all my goal is 4 losses in a row and I want that new gym bag I previously have refused to buy it until I have had 4 losses. Tina the leader has also mentioned a challenge which is going to happen, something along the lines of losses in a row and Christmas, I like the idea of setting yourself a personal challenge of say 4 losses, rather than 5kgs as at present, a success is consistent losses. After a while I will change it around and do a certain amount of losses, perhaps a weight one and then a exercise challenge. So, it is a very long road, I just have to focus on 1 day at a time. The key I think is to keep focused and the mindset strong and as well to run my own race. Just a quickie post - wow 2nd for the day. Went to Mawson Lakes with the lovely Tina, Karen, Sandy and Jo with the gorgeous Tania at home ill and lost 2kgs. Thrilled, now to work on Week 2 (days 7 to 14). Post tomorrow. You know, the difference in my mental state when I am doing well with my food choices is remarkable. A lesson learned I suppose. It is 4pm and I should be hanging that washing out. This morning got up and went and got my hair done, my hairdresser has sold her shop to be a sale rep for a hair company and luckily there is 10 of us that she is doing our hair at home. THANK GOD. So got dressed and headed up to Kelly's. I am wanting my hair cut, so we have made a deal -10 kgs and I can cut it. Explained my going to Mawson Lakes, she nearly died of shock that I was travelling that distance but the thing is, it doesn't worry me as I am going with my dear friends and that is such a wonderful thing, makes a huge difference. Finished the hair colour and cut and headed for a brunch/lunch which I had a skim latte, again no sugar (the no sugar in the coffee is going well) and an egg and bacon sandwich with no butter on multigrain bread. A Saturday morning tradition for me and keeps me satisfied whilst I am running around. Whilst eating I planned my food for the week and a couple of new recipes from an old WW Cookbook I dragged off the shelf. I did the grocery shopping, with list in hand and was aware of the sugar in foods and how I was trying to avoid it, although I can't come to natural yoghurt and will still have my yoghurt I normally have which is from the Yoghurt Shop and their skinny version made up as I refuse to have artificial sweeteners due to my sleeping. What was good was I stopped at the bar section- you know the WW Bar, muesli and fruit bars and thought NO as I know that I will not be able to stop at 1, it would be one box, so I thought of the savory options I could have and brought some rice crackers and salsa to take to work and some crumpets. So far so good, but this is only Week 1 and Day 4 - so I think it is reasonable to expect me to be quite good this week, if after week 10, I am still focused and there is a shift in the weight - then I will be happy. Plan to watch my favourite footy team play on the TV tonight and tomorrow will stay home and do some household stuff and some cooking for the freezer so that when I come home from the gym next week, I can just reheat something or make a quick meal. Tonight's dinner is a very basic meal, chicken and roast vegies with gravy - but something I love and will have my favorite yoghurt afterwards. Anyway, glad to report that the scales are still in the shed and I haven't got them out, hopefully the food intake will keep me focused. Really decided that I need to be a bit selfish if I am to succeed in the journey, chatting to my hairdresser today I am a type of person that puts everyone before me, family, friends, work - it is time that I started putting myself as no.1. The plan is to focus on me and only me, if others don't like it then stiff ! Unfortunately, Vince the wonderdog can't do the housework which is still sitting there to be done. Have a good weekend. Well girls, last night I drove the long drive to my WW meeting. Meet my darling friend half way and she directed me to where I should be going. We meet at the entrance to the drive in and took each other's before photo which was a front and side photo. I was obsessed about doing this all day, not sure why and so it was important for me. The face on photo is not good, but brilliant compared to the side photo (will post them later on). What is good that it is on the iphone and I plan to look at that photo when I feel the urge to stray and eat I went to the meeting hand in hand with Karen. We both were a bit emotional for different reasons, meet Tina (leader) who was brilliant, joined up and weighed. On the way in the car, I kept thinking I can do this, please do not let me be over 120kgs. Got on the scales, 122.5 and so over the last month or so I have gained around 6kgs. So I sat down and waited for my friend to be weighed and then dear friends Tania and Tina arrived - thank god for those beautiful girls. I really felt at home. Tania and Tina meet for a quick coffee aftewards, Karen and myself waited back and had a chat to Tina the leader and discuss the program. You see around 12 months ago I had Tina's husband Don as my leader, had the mindset happening and had no doubt that I would have got to goal with him, I had lost my way ever since he resigned from Weight Watchers. So purged this feeling to my leader. She initially for this week only set us both on 22 points. Karen is normally on 25 points and myself on 24 points. She said that we should bounce of each other and keep each other's graph of weight loss on each other's pantry to inspire us. We both purged and let out how we were feeling, mine have been documented before and dear Karen for very personal reasons I won't put on this blog. There were tears shed. Meet Tina and Tania for a coffee, Karen kindly brought me a coffee (skim cap of course) and I went cold turkey and said no sugar. You know girls, I drank that damn coffee and didnt find it too bad. I drove home which was quite a distance and really had time to think, shed a few tears and really was so driven by the time I got home. I walked into the house, turned the TV on, gave Vince the wonderdog a huge cuddle as he hadn't seen me all day and was in overdrive for a cuddle and stripped off and measured myself. Will do the measurements again tonight to ensure they are accurate. I went to bed with a feeling of the line had been written in the sand, it was time to focus on what needs to be done remembering this is not a race but baby steps and even 1 hour at a time if need be. Hardly slept at all and tossed and turned all night which drives me absolutely around the damn bend. Had breakfast and planned my day's eating. Unfortunately I am going to a friend's for dinner tonight so will take mineral water and have left more than enough points for that. This morning, normally I stop before work and have 1 smallish latte and a medium one to take away, both with 2 sugars. This morning I had my smallish latte and again had no sugar and it was drinkable and not as bad as I thought, I didnt have the additional latte like I normally do. So day 1 underway, water bottle on desk and focusing on getting through today, tomorrow I will focus on getting through tomorrow. Well the weekend has been and gone and it is Monday AGAIN. The weekend of course went far too quickly, the eating so so. Saturday fluffed around and went up to Marion Shopping Centre and had a coffee with best friend Joanne and her great husband and came home and did stuff around the house. Sunday, which was father's day had a girfriend over for a meal as my beautiful father lives interstate and so at 8pm last night I am ironing. I plan to make next weekend a stay at home weekend, other than hair and nails on SAT morning and of course the gym, to stay at home and get some jobs done. Cupboards need a bit of a tidy up and some things thrown out. I am relieved to say that tomorrow I am going to my new Weight Watchers Meeting, time to get serious. It is just a huge weight off my shoulders, to think that I am going with darling and treasured friends Tania, Tina and Karen and so will get the support I need, plus I know the leader is a good one. So tonight, as it is bin night, I will throw any crap out of my cupboards and into the bin. The plan is to make Weight Watchers enjoyable, I do enjoy cooking so find the planning etc and routine of it quite therapeutic and so tonight I am taking measurements in preparation. The reading of Sweet Poison is going slow, it is quite intense and technical but have come along a section regarding seratonin (which helps you sleep) and sugar. As you know my sleeping is really quite seriously bad, once the insomnia started the weight increased. I have no doubt they are interconnected and so I was a tad excited. The plan for the next week is to just focus on the WW basics, get into the rythmn and do babysteps. I have no doubt I will be 120kg's but that is fine, the line will be written in the sand. I am pleased with my decision, a nice new book is always good to write down your loss. So girls, I am starting to get my head into gear, I do realise that for my well being and mental health, I need and want to do this. Will report in on Tuesday night after my meeting. Well it is Friday, what can I say but "thank you god !". Woke up at 7.55am this morning - should be on the road by that time. My sleeping is shocking at present. Last night went to Target on the way home, actually did go shopping but it was because I wanted a Scone with Jam and Cream and a coffee. Went into Target and they had this great mirror which I brought (with my birthday voucher money) and saw the Sugar Poison book out, thought I will buy it. So did that and took it home and will start to read it on the weekend after I have done the housework. Looking forward to Tuesday, it is basically a relief to know that I am about to start feeling somewhat better and just get back into the routine, I plan to try and be as clean as possible with my eating. Many many moons ago Weight Watchers had a program called Core which was basically whole foods and no processed foods, I know when I have followed this previously that I am not hungry and do not suffer from binges or cravings and of course the energy levels have increased. I suppose when you eat badly you can feel it in your body, with me the energy levels are none existent and it is a side effect of putting all that crap in your body. So, for me it is just planning and organising. Of course with this lack of energy the stuff around the house does not get done, that causes me more stress so plan to get all the jobs at home done, stock the fridge and freezer and be ready for Tuesday at 6.30pm. The road ahead needs me to be a bit selfish, why is it that we think it is a crime to put ourselves first? So that is what I am doing, putting myself first. 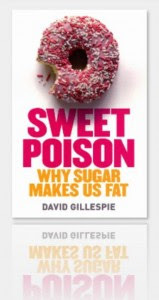 There has been a lot of posts on facebook recently regarding sugar and in particular a book called "Sweet poison" which I am yet to read but something I do find intriguing. You see when I go on a binge, it is not for savoury things but sugar. For example, last night I ate and ate and ate. 6 donuts, a serve of indian, a 3 seasame snaps and a big block of Turkish delight chocolate. My taste buds are now non existent. We seem to concentrate on fats but really we need to look at the sugars. The more sugar you have, the mores sugar you need. This is something I have become more and more aware of over the last few years. Of course all this eating sugar is not good for us, makes me gain weightt in the middle and overall not good, with the rise of diabetes and the risks of being overweight have as far as getting diabetes I realised last night what needs to be done. Sometimes we need to fall hard to realise what needs to be done. For me, weight loss is not just about the lovely clothes, being a size 12 or even having men chase after me (well that would be good) but it is about confidence and happiness and that mental edge. The more sugar and weight gain I have the more my insomia plays up. For example, the last few weeks with me not following any food plan at all my energy levels are low, at any point I could sleep for hours and this is all the effect of bad eating and sugar. Today I read a great blog http://msbitchcakes.blogspot.com. I always check out Bitchcake's blog, the fact she is so individual with her look and lives in New York she does at times have some pearls of wisdom. Her topic of activity was an eye opener to me. So overall, the position I am in at present is that fact that the food I am eating is making me ill, letheragic and depressed. The answer is simple my friends. Change your life. Somehow I feel that I am on the right path, the support of friends and a good meeting with a leader I know is great, although my leader I had Di is great, I am not in love with the meetings. Saying all this, you can have the greatest meeting, the fabulous friends and the best leader and still fail, you have to draw strength from yourself, get that mental discipline happening and overall realise that you need to be selfish in order to achieve your dreams. In one way, it is a relief to be able to say that from Tuesday my eating will improve, of course the withdrawal of sugar is hard but I am going to set little babystep goals and not weight related. First goal - Join on Tuesday and Second Goal is to have 4 losses in a row. Quite doeable.